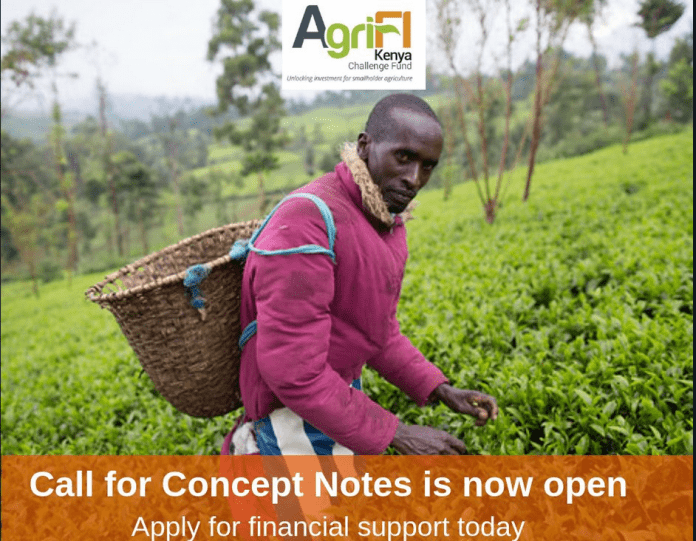 The AgriFI Kenya Challenge Fund is a European Union initiative to support productive and market-integrated smallholder agriculture through the provision of financial support worth EUR 18,000,000 to agri-enterprises. The aim is to contribute to improvements in the capacity of smallholder farmers/pastoralists to practise environmentally sustainable and climate-smart agriculture as a business in inclusive value chains. The Challenge Fund is funded by the European Union and co -funded by SlovakAid and is implemented in parallel with a planned بنك الاستثمار الأوروبي (EIB) facility provided to local banks. Self Help Africa و Imani Development Limited are the Fund Managers for the programme. The Challenge Fund will run over three open calls, with a total time for the overall project at approximately 60 months. Each call will have the same operational structure, however with possible variations in criteria, number of projects etc. based on learnings from earlier calls and to ensure the project meets its overall objectives. Each call will be defined by a specific set of guidelines that will be endorsed by the Programme Steering Committee. The selection process will last 6 months from start to finish, with a 24-36 months for implementation, making each call approximately 36 months on average. The first call for proposals targets to award Euro 6 million to 15 projects in total at an average of Euro 375,000 per project.